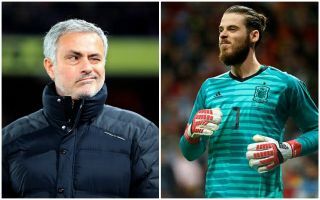 Manchester United goalkeeper David de Gea has set two big conditions to stay at the club and sign a new contract amid transfer gossip linking him with Juventus and Paris Saint-Germain. The Daily Mirror mention potential interest from Juve and PSG, and explain that De Gea wants a big pay rise to stay at Old Trafford. Alexis Sanchez is currently United’s highest earner on a ridiculous £500,000 a week, and it makes sense that De Gea is eager to be earning something like that given his importance to the club. The Mirror claim that is the case, and also add that the Spain international is keen to know what Jose Mourinho’s future will be with United. The Portuguese isn’t doing the best job with the Red Devils right now, and it makes sense that De Gea may be concerned about his silverware prospects if he stays in England. The 28-year-old could undoubtedly play for almost any club in the world and would likely win big with Juventus or PSG, who are dominant in their domestic leagues and look like becoming serious Champions League contenders. MUFC seemingly have a big job on their hands here if they are to keep De Gea at the club.